The Dickens Swiss Chalet is one of the most iconic buildings in English literature, but it is in urgent and desperate need of repair and conservation. The Rochester and Chatham branch of the Dickens Fellowship has set up an appeal. The Crowdfunding set up by David Hawes has now closed, having reached its target of £250. 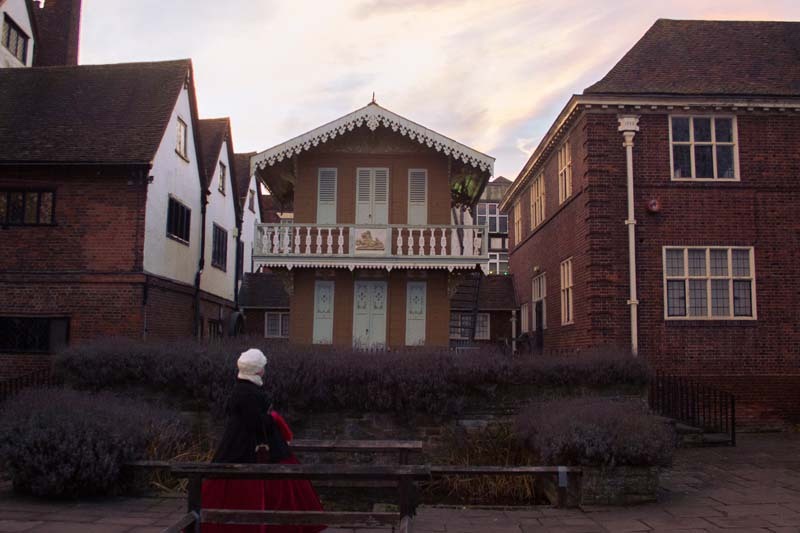 The two storey Swiss Chalet, where Dickens wrote some of his greatest works, is now sited in the gardens of Eastgate House in Rochester High Street. It was given to Dickens by the French actor Charles Fechter, arriving in ninety four pieces on Christmas Eve 1864. In a precursor to many 'DIY' jokes, Dickens attempted to construct the Chalet with the help of his friends but failed disastrously. Eventually he went to the stage carpenter of the Lyceum Theatre in London for help. 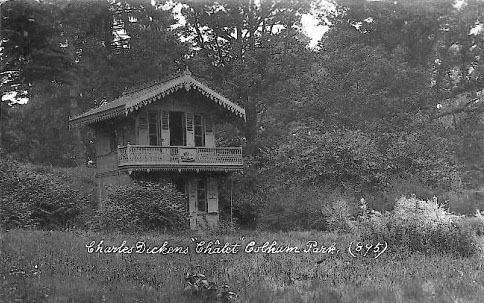 The Chalet was erected on land Dickens owned across the road from his house on Gads Hill. Access was by an underpass which he had built under the road in 1859 because he was unhappy with the traffic and the mud. The Chalet was oriented to allow views of the river Thames in the distance, and he set up a telescope so that he could see passing boats. His biographer Forster describes the interior of the Chalet in great detail, and describes five mirrors and several bronze ornaments representing toads in comical situations. 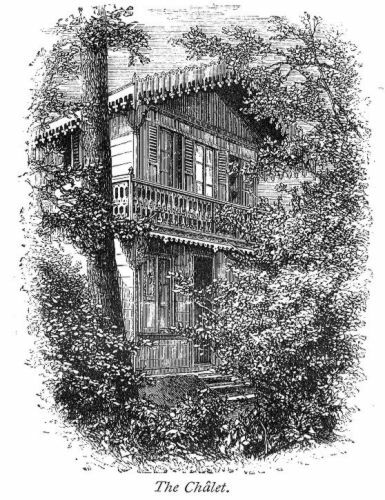 It is clear that Dickens loved the Chalet as a retreat as well as a calm place to work. On the day of his death, 9 June 1870, Dickens was working on 'The Mystery of Edwin Drood' in the chalet. Late in the afternoon he was on his way back to the house when he collapsed and died from a stroke. After Dickens' death the chalet passed to his eldest son, then to Dickens's sister-in-law Georgina Hogarth, and later to the then Lord Darnley, who erected it in the grounds of Cobham Park. We understand that the Chalet deteriorated over time, and at one stage was sold to the Dickens Fellowship for a nominal amount. the Swiss Chalet still carries traces of the indignity it suffered when camouflage paint was applied to disguise it in World War II. The Chalet is a remarkable and fascinating reminder of Dickens' connection with the Rochester area. At the time of writing it is to be found is in the garden of Eastgate house. From the outside it looks in good condition, but in practice it is very fragile and not safe to enter. Preparatory work in restoring it to its rightful condition has revealed structural weakness which dates back to an earlier restoration. For the latest information about progress in restoring the Swiss Chalet visit the Dickens Fellowship's appeal page. 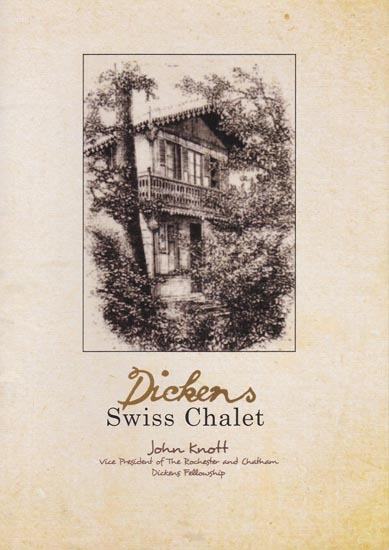 The Rochester and Chatham Dickens Fellowship has published a slim volume, 'Dickens Swiss Chalet', by their Vice President John Knott, which includes fascinating information and rare photographs on the subject of Dickens and the chalet. All profits are going to fund the restoration. 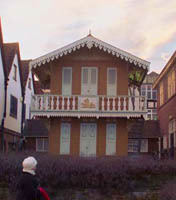 The Swiss Chalet was used by Charles Dickens as his study. Whilst it was in the garden of his Rochester home at Gads Hill he wrote five of his novels and many stories and articles. Now it is in desperate need of repair and conservation to preserve it for future generations to enjoy. The chalet is in a serious state of deterioration, being supported internally by steel struts to secure the structure. You can help by donating to the appeal. Any amount you can afford will be gratefully received. To contribute online please visit the Rochester and Chatham Dickens Fellowship web page and scroll down to the bottom of the page.